Perry A. King studied industrial design in the UK and moved to Italy in 1964. He acted as a consultant for Olivetti, working on a wide range of products including the Valentine typewriter and Sistema 45. Later, as Design Coordinator for Corporate Image, he designed e.g. dot matrix fonts, books and posters together with Santiago Miranda – with whom he founded King Miranda Associati in 1976. He has taken part in all kinds of conferences and been on the jury of design competitions throughout the world. He is also engaged in teaching and research as a professor at Milan University of Technology.Perry King has taught as a visiting professor for a number of years at the London School of Architecture and Design, part of the Royal College of Art, and was appointed Royal Designer for Industry in 2000. He is on the Senate of the University of Central England and is an honorary member of the Senate of Glasgow School of Art. He is on the Board of the Royal Society of Arts and a member of the Chartered Society of Designers in the UK and the Italian Associazione per il Disegno Industriale.After completing his studies at the Escuela de Artes Aplicadas y Oficios Artisticos (School for Applied Arts and Crafts) in his birthplace Seville, Santiago Miranda moved in 1971 to Milan, where he founded Miranda Associati with Perry King in 1976. In the preceding years he worked as a designer, developed 'Air Mail Transatlantic Pictures', stories and images for an interactive park for lonely people, and worked as a consultant for Olivetti. He is also engaged in teaching and research.He is a professor at Milan University of Technology and a member of the scientific committee of the Istituto Europeo di Design in Madrid. He has taken part in many conferences, and sat on the jury for many design prizes. Santiago Miranda was awarded the Premio Nacional de Diseño Español (Spanish National Design Prize) in 1989, and the Premio Andalucia de Diseño (Andalusian Design Prize) in 1989 and 1995. 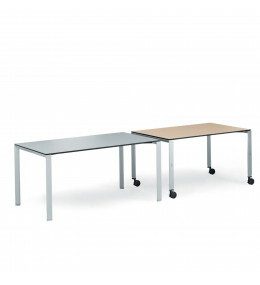 Ahrend 700 Tables can easily be combined with a lectern or a projector trolley.